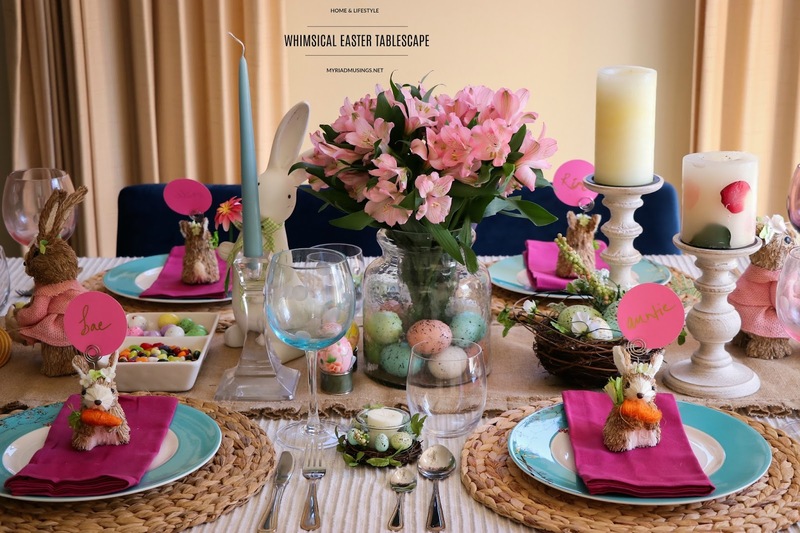 Easter is two weeks away and if you are entertaining friends and family, this Easter, then I have the perfect tablescape for your get together. 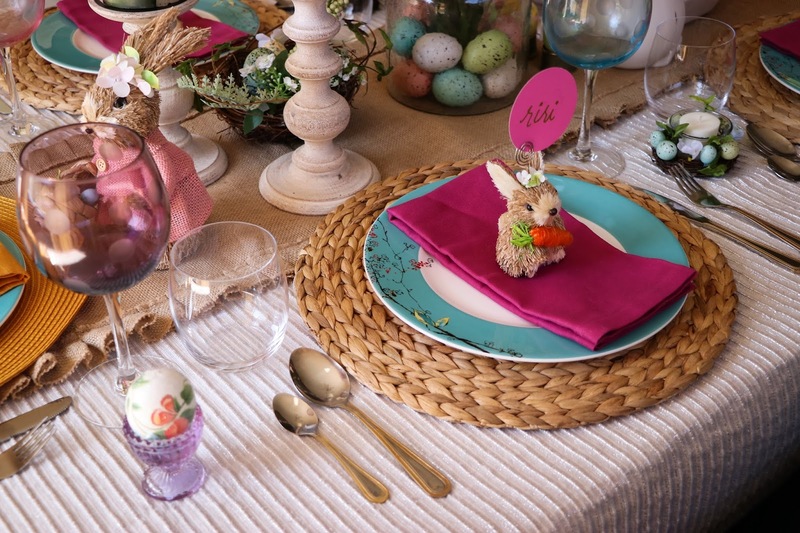 It is whimsical, festive and you could totally mix and match your dinnerware and other props. 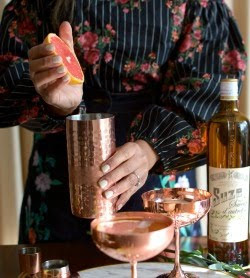 I wanted something fun, that was occasion-apt and incorporated pieces that I had readily available around the house. 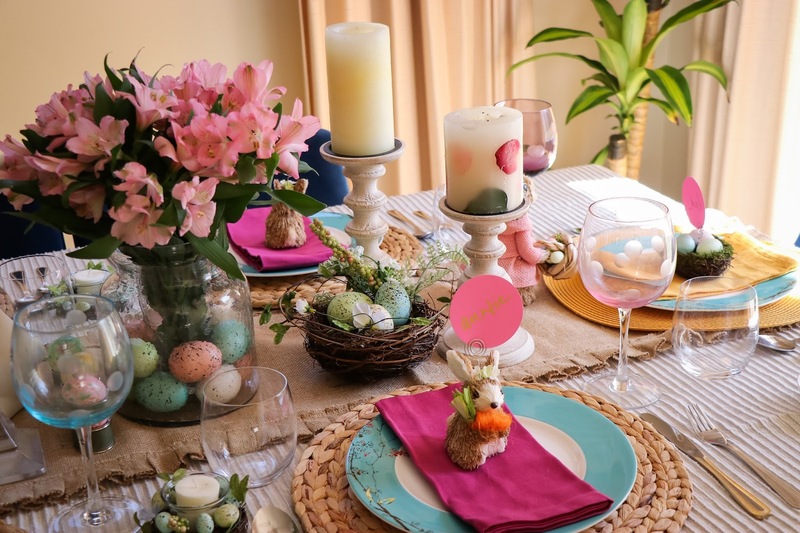 Honestly speaking, you don't need a lot to put together a tablescape, just a few basic rules and a handful of Easter props and your tablescape would be ready for entertaining in no time. 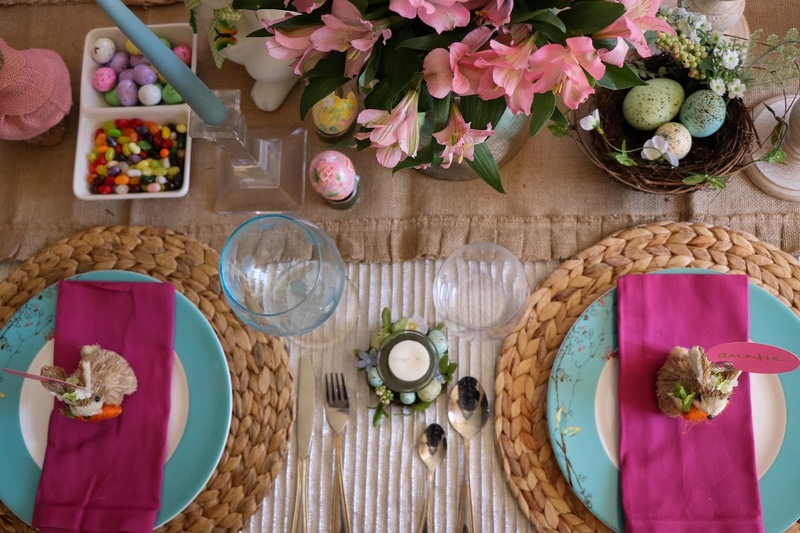 The first step in curating any tablescape is to decide the theme. A theme could be character-based, story-based or color-based. 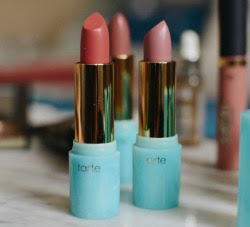 Having a theme not only will make your prep work easier, but your shopping gets streamlined too. 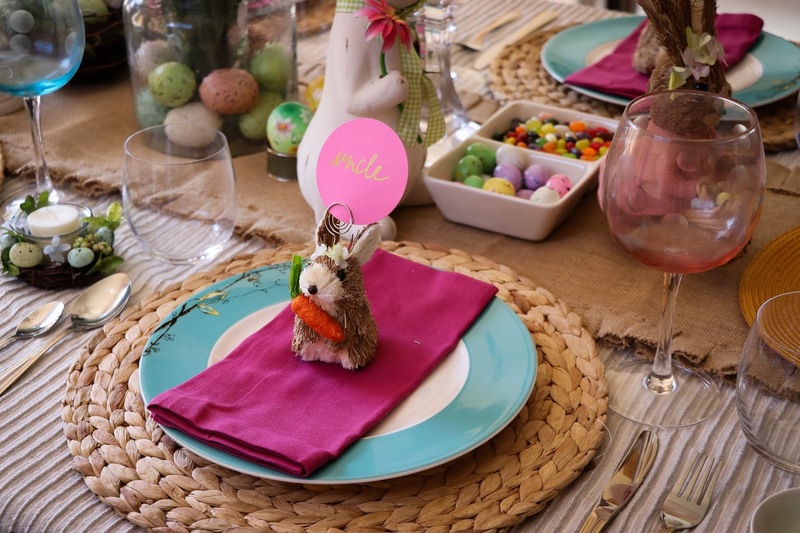 As obvious, my theme for this tablescape was Easter and spring. I wanted to achieve a more rustic natural look for the base, hence the rattan mats, tablerunner, and candle holders. 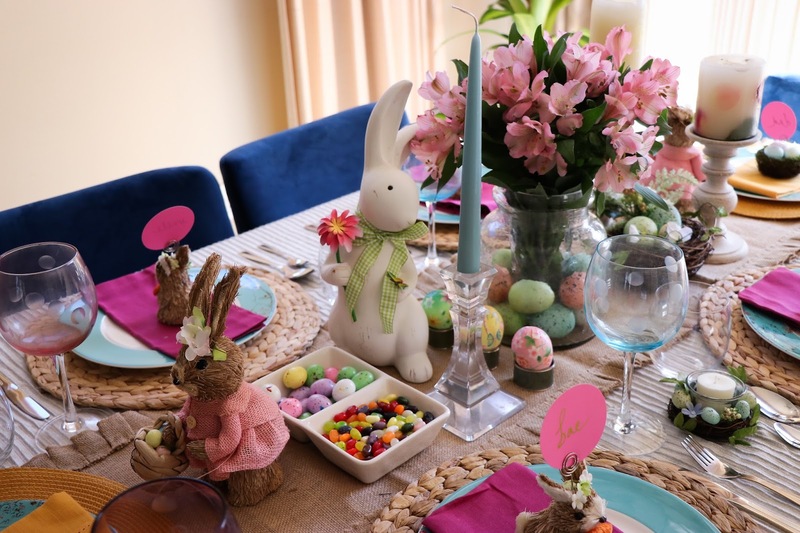 Most of the pieces including the dinner plates, napkins, flower vase, silverware, candles, and placemats were my own, rest I had to buy the remaining stuff to put this tablescape together. For starters have a focal point, it facilitates branching from the center out. 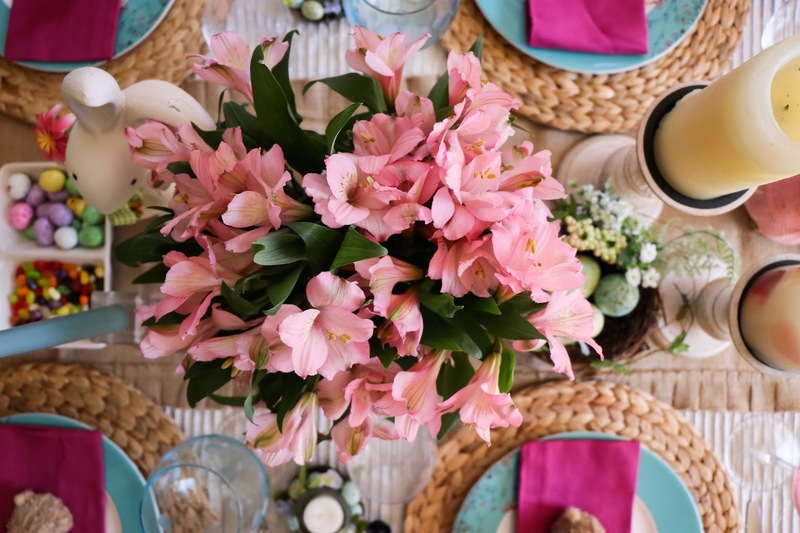 The entire table runner and its content make my focal point. 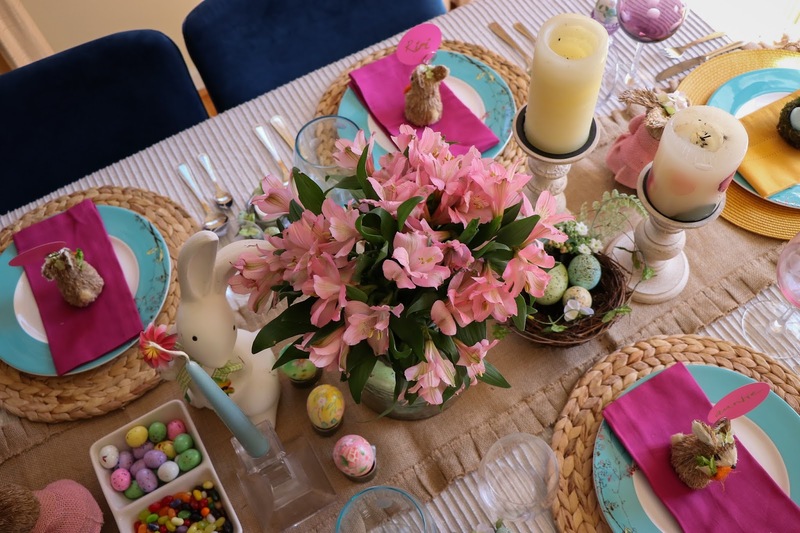 I created the flower vase by putting one small glass inside that larger tumbler, slid some eggs into the gap, filled the smaller glass with water and plopped some fresh flowers. 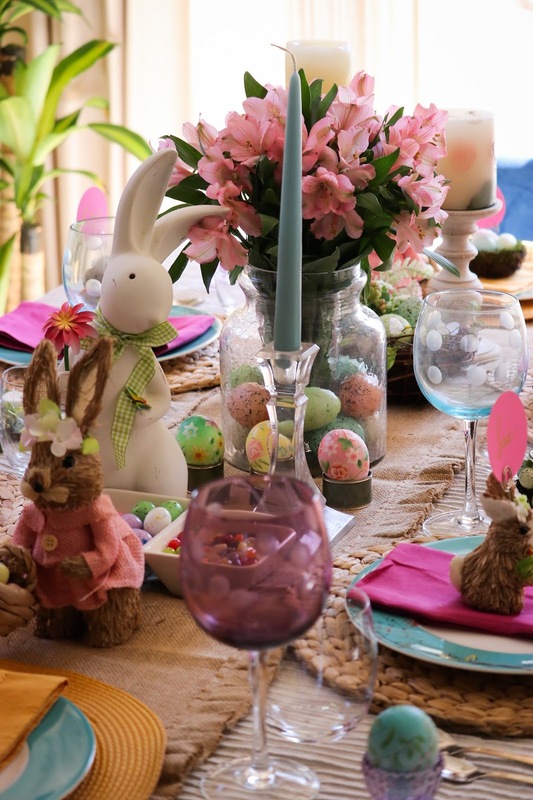 To continue with the flow, I added the porcelain bunny and the two candle holders. 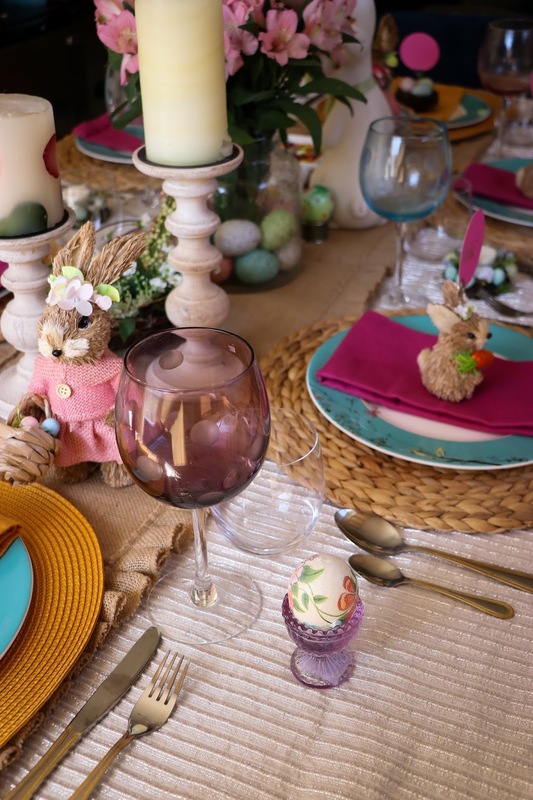 The classic-casual order in which the plates are placed is charger first, then dinnerplate, then salad plate, the bowl ( if using one), otherwise topped off with the napkin. To the right of this plate- setting goes the knife first and then fork on the extreme right. To the left of this setup goes the dinner spoons. 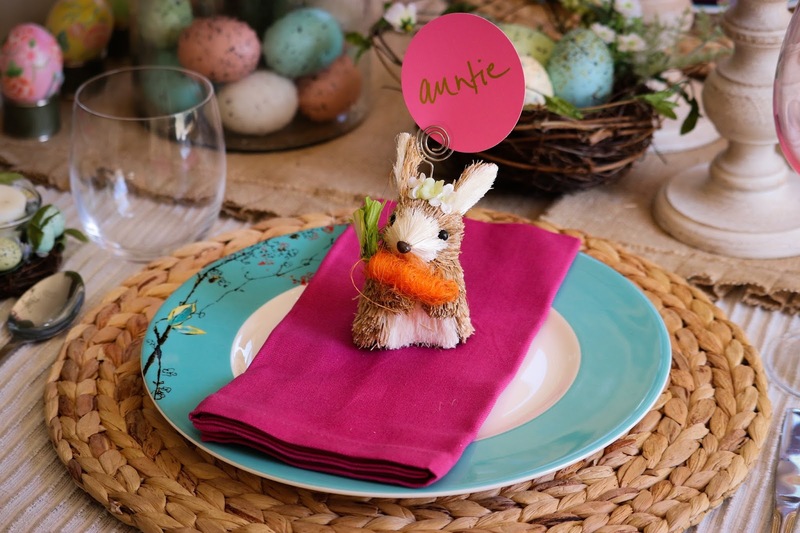 I tri-folded the napkin and placed the bunny personal name card holder, but if you're looking to spruce up things a bit, you could find the bunny napkin fold here. I had some colored goblets which made a good addition to this setup. 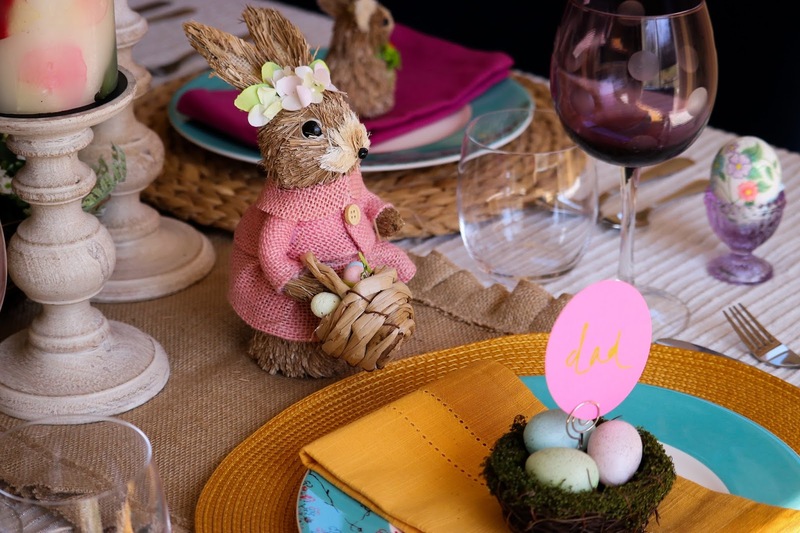 The straw bunnies are just an extension of the rustic flow and so are the straw egg votive candle holders and the painted eggs. 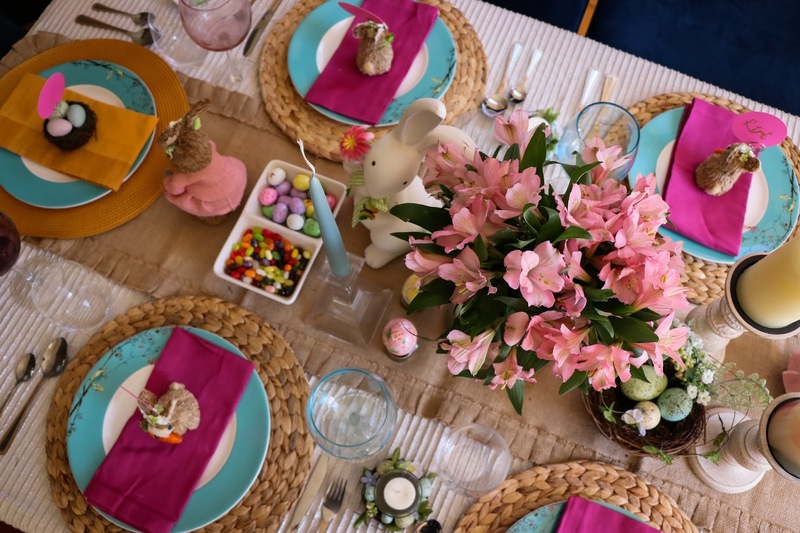 Any Easter tablescape would be incomplete without some candies and jelly beans, so I had to bring them on board. This is my take on the Whimsical Easter Tablescape, how are you setting up your table this Easter?